Midwest winters can seem endless. The payoff? Perfect summer temperatures! Each year I vow to savor every minute of the warm weather. Although I can’t put everything on hold, I can live summer to the fullest, by participating in that wonderful warm weather tradition— a week at the lake. Here are a few favorite laid-back lake resorts in the Midwest. Just under two hours north of my sweet home Chicago is The Abbey Resort, the only lodging directly on the shores of Wisnconsin’s Lake Geneva. There’s a newly renovated spa, sailing school, indoor-outdoor pools and an arcade. My favorite thing to do? 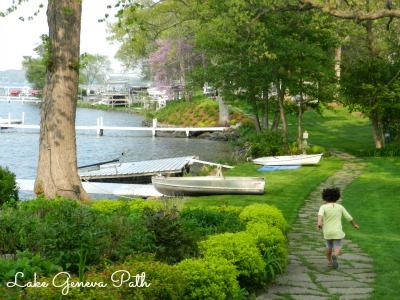 Walk the Lake Geneva path, a rustic walking path that encircles Lake Geneva, cutting right through the backyard’s of the magnificent mansions and spectacular second homes of this area that’s been called the Newport of the Midwest. Circling the entire lake would take you a good ten – twelve hours, but you can pick a section and go for a jog or a leisurely stroll. As it’s a very narrow path with stairs and flagstone steps, there are no bikes allowed. Twelve miles north of Lake Geneva on Delavan Lake is the classic Lake Lawn Resort. Lake Lawn has a tiered lodging system, so you can get something simple or more extravagant, depending on your family’s size and preference. The Osthoff Resort, in Elkhart Lake, Wisconsin, is another Midwest classic. It’s far from a rustic retreat though. Conde Naste readers just awarded its Aspira Spa third place in the nation— not bad for a hotel in rural Wisconsin! Rent your own boat and waterski on Elkhart Lake or hit the trails at nearby Kettle Moraine State Park. hosting races, vintage car events, even specialized driving schools. Siebkens Resort is home base for the racing crowd. Things really get revved up on Wednesday nights with live music and dancing at Siebkins’ Stop-Inn Tavern. Just over an hour west of Elkhart Lake is the Heidel House Resort, on Wisconsin’s deepest inland water, Green Lake. Northern Michigan is also filled with summer lake resorts. The Fountain Point Resort in Lake Leelanau proudly keeps it old school with their rustic tv-free cottages. Homestead Resort has a mile of postcard-perfect Lake Michigan shoreline, right next to the Sleeping Bear Dunes National Lakeshore, named the most beautiful place in America by Good Morning America viewers in 2011. In addition to the jaw-dropping scenery, there are pools, tennis, golf, a spa, even a kids club so adults can have time alone. Looking for more excitement at the lake? The all-inclusive White Birch Lodge, near Traverse City, Michigan, is known for its watersports program. Teens and tweens will love getting to waterski, go tubing and end the day swapping adventures with their new friends around a beach bonfire. Midwest lake resorts are good old-fashioned fun. It’s a chance to unwind and unplug, taking time to relax to the rhythm of the lake and enjoy time with your family. Disclosure: The author and her family stayed as guests of the Abbey Resort for purposes of researching this article, but all the opinions are her own. Andrea Guthmann is a freelance journalist focusing on family travel. She spent many years as a writer/producer for WTTW-TV, the PBS station in Chicago. Her travel stories have appeared in the Chicago Tribune, Chicago Sun-Times, Chicago Parent and on-line travel sites. A native Floridian, Andrea’s now a big (windy) city mom of 3, who range in age from pre-school to high school. She loves sailing Lake Michigan and visiting the world class museums and restaurants in her sweet home Chicago. Being a scenery starved city girl she loves escaping to the outdoors during vacations and is working hard to raise 3 happy campers. I LOVE this post and now have even more places to visit in the Midwest. So lovely! I feel like I got lucky moving to an unnoticed part of the country by many as it’s such a beautiful part of the country!